So it’s been range trading but with an upward bias for the markets into the coming weekend’s Greek elections. Greek stocks got a 10% pop yesterday on unofficial polls pointing to the pro-austerity party winning. Natural Gas also advanced over 10% – the two biggest dogs of recent times sharing a bumper day together. Economic Surprises continue in their downtrend. The latest leading indicator readings for the UK came in positive and Korea just slightly negative – the global picture continues to be mixed at best. Italy and Spain CDSs continue to flirt with records. The UK government announced measures to improve credit. Now we see what the FOMC delivers next Wednesday. I don’t expect QE, because the US economy is doing relatively OK and it would likely only serve to push up asset prices rather than boost the economy, but I do expect a Twist extension, or something similar, as letting Twist expire and doing nothing would amount to tightening. I expect they will downgrade their wording on the economy and recommit to doing more if things worsen. Everyone can see the inverse Head and Shoulders on the stock indices currently, which by textbook would see us break up and rally significantly in the coming week, but a couple of historic rhymes also show that a drop and higher low could come to pass over the next few weeks before a rally. I have trimmed back my pro-risk positions very lightly today, taking profits on some of those that picked the bottom, but leaving the vast bulk in tact. The Greek elections and FOMC are uncertain. The new moon occurs Tuesday but geomagnetism is expected to lead into it. It feels a bit more of a lottery than usual, but nevertheless, I remain heavily long pro-risk expecting that we will see (i) a mean reversion rally away from oversold/overbearish (whether that has already begun or needs another low ahead first) and then (ii) a commodities secular bull rally conclusion from here into next year’s solar maximum together with an accompanying rally in stocks that ends before commodities make their final mania. So how might my secular expectations from here come good? First, a natural pick up in growth and inflation, as per action into previous solar maxima. Speculation in commodities will be the key driver of the inflation side. Evidence of a pick up in leading indicators and economic surprises, particularly in the US and China, would confirm a pick up in growth and encourage that speculation into commodities, but as yet we don’t see that. Second, co-ordinated global policy responses in easing and stimulating would also provide the push in growth and inflation. This process appears to be underway with recent intervention in China, Australia, UK and others. 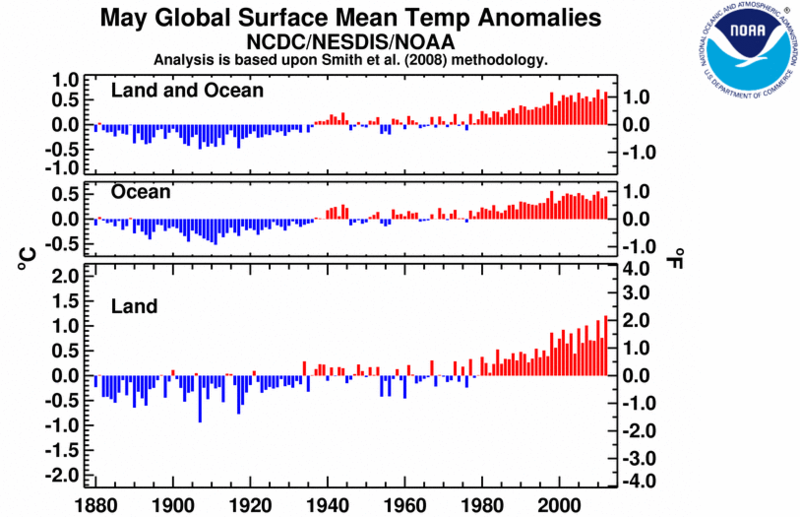 How quick and how comprehensive the global action is from here, remains to be seen. The European debt accuteness needs further action, as the Spanish bank programme failed to satisfy. Some kind of action by the Fed is expected, and most likely needed, to satisfy the markets. I continue to expect we will see a combination of the natural pick up in growth (very supportive monetary and fiscal conditions worldwide, oil and commoditiy prices recently receding) together with a series of global policy reponses, so both elements, but for now this remains tentative. Thirdly, a supply-side push on commodities. Into solar maxima we historically have seen war, protest and revolution. As sunspots rose in early 2011 we saw the Middle-East and African uprisings and UK protests. As sunspots are rising again currently we are seeing an increase in protests in Russia and fighting and protesting in Syria. Iran remains a potential flashpoint as a key supplier of oil. A perceived supply disruption would push oil prices and by association food prices. Again, this remains just potential for now, but there is also a possible supply-side push in food, without oil’s input. In the first half of 2010 we saw several months of global temperatures being at all-time records, whilst soft commodity prices remained fairly depressed. The result was a major rally in food prices in the second half of 2010 as those record temperatures devastated plantings and harvests. Here in 2012, food prices are again currently depressed, and although global temperatures weren’t extreme in January-March, in April we saw the second highest ever global temperatures for that month on land, and May’s stats, just released, reveal that May was the hottest May ever on land. The result is current drought and excessive dryness in US, Argentina, Russia, Korea and Australia. If we see another couple of months of such extremes, I expect food prices to surge again in the second half of 2012. Recall that global stockpiles remain low, but record plantings depressed prices. If these plantings are decimated by dryness and drought, then the critical stockpiles come back into focus. Food and gold prices reveal a close correlation, so a push in food would likely be accompanied by a push in gold, as an inflation hedge. Fourth is the secular position for equities. Recall that my charts comparing historical secular stocks bears reveal that at this point stocks are unlikely to see much lower in nominal terms again, and that we should be looking upwards to stocks, not down. We should see a rally in stocks here, which is also supported by presidential cycle seasonality, but which ends before the commodities final mania ends. There is an interesting situation with European equities, whereby they have reached their secular bear valuation buy signals at this point. Historically, a secular bear ends when CAPE reaches below 10. You buy at that point and are rewarded for the next 10 years with an average return of around 15-20%. 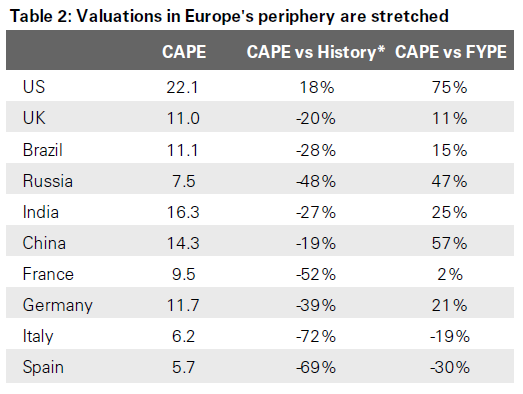 Furthermore, very good buy opportunities have arisen when FYPE (forward earnings valuation) exceeds CAPE. As you can see, Spanish and Italian stocks are well below 10 and the FYPE exceeds the CAPE too. For reference, the lowest CAPE historically that we have ever seen was 3, reached by both Thailand and Korea. Guess what? Greece has now beaten that with a CAPE of sub 2. So, with some confidence we can say that buying Greek, Spanish and Italian equities at this point is likely to pay off handsomely over the next 10 years, but clearly the risk is for more downside before the upside eurupts. Here is the chart again showing that the p/e for Germany is back at the last secular lows. Here we can see the Eurostoxx index has made a third major low in this secular bear market. 3 major lows have defined historic secular bear markets, before a new secular bull erupts. 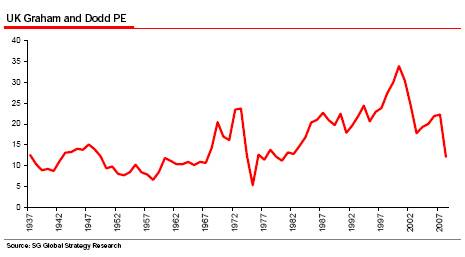 Here is the UK cyclically-adjusted P/E. It is also back to where it was at the similar point in the last secular bear (around 1979). I note that it made its nominal low in the middle of the last secular bear, which looks a little different to the equivalent US chart which made its p/e low at the end. In the last secular bear, Japan’s ending CAPE was around 20. This may be accounted for by it being a leading index then, going on to its amazing peak in 1989. Is the US the leading index now? Could we have bottomed with the US at CAPE 20 and European stocks in single digits? Well I think not yet, but we are getting close. I believe some other major indices need to drop beneath CAPE 10, not just the PIIGS, but we can see the likes of the UK and Brazil are close. I believe that more comprehensive drop beneath CAPE 10 will occur with a bear and recession following next year’s commodities finale. But the likes of Spain and Italy are so cheap now that I wonder whether they may now go on to outperform, and not look back. It’s either that, or they go on to join that club of the cheapest CAPEs ever. Clearly we need some more enduring and satisfying policy responses in Europe to enable them to rally sustainably, but at the same time once we have those in place, European stocks are likely to be much higher. In summary, I think the message is clear that we are reaching towards the end of the secular stocks bear in terms of valuations. I don’t believe we need to see US stocks halve in order to reach under CAPE 10, as we can see from the range of ending CAPEs in the last secular bear. I expect that once we see the likes of Germany, Brazil and China under CAPE 10 we are done, and I expect that point to come next year or the year after, in a cyclical bear following a commodities mania conclusion linked to 2013’s solar maximum. 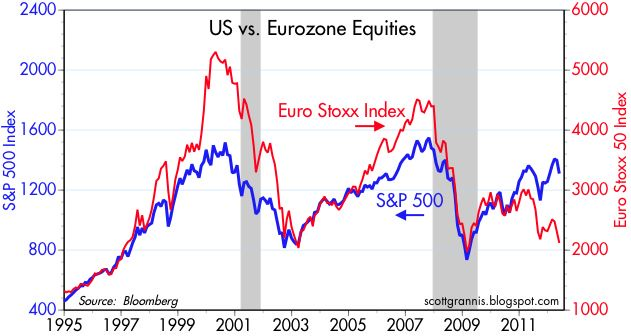 One problem with buying European equities here is the currency issue. Greek equities may look really cheap, but if Greece leaves the euro and devalues the new drachma by 50-70%, most (if not all) of your early gains will be offset by currency losses. If you look at what happened when Argentina broke its peg with the dollar in 2001, equities bottomed in peso terms in 11/01 but did not bottom in dollar terms until seven months later. It may be better (and safer) to wait for more clarity on the whole euro issue before making the plunge. Fair point. Depends how you are playing the markets e.g. investing in a fund where your money is converted into the currency of the fund. If you were spreadbetting the nominal index then the currency wouldn’t matter. Excellent article John. I agree with your reasoning re solar maxima, stimulus, weather/commods and a pick up in M&A leading equities higher and your conclusions. I ahev continued to be bullish through this dip and have added in places. I am writing an article on cycles and will link to it when I have published it. By the way, the highest CAPE ever achieved was Japan, just short of 100, at its Nikkei peak. This is a smashing piece John and probably one of your best to date. I have taken profits on all my equity positions before we head into this weekend just as a precaution and on the off-chance that we drop back a little next week. However, I am fully long silver and gold having added further to my positions last week. I expect next week to be volatile and so I’m happy stepping back a little and watching events as we get through the early part of next week. I don’t expect a Greek eurozone exit despite what much of the press thinks. Any Southern European countries being outside of the Union would perhaps be more disastrous than remaining within it. I therefore expect bail-out activity for the remainder of this year but with some major deep pocket action for Spain. Spain simply has to be stabilized and very quickly. I guess we’ll see how it all plays out in due course. Have a great weekend! …..interesting chart from Tom, with a little expansion on his parents’ analysis. Happy Father’s Day to all Dads. Excellent stuff, John! Your hard work is much appreciated. Many thanks Jonathan, Fiona and Charles. Monday morning in Europe, and a positive outcome in Greece last night, although it more than likely buys time rather than resolving anything. Still, the market reaction today is what’s important – it’s a gap up so far, but will we see the gap hold or will we see it reversed like the Spanish bank agreement gap? There is a geomagnetic storm raging, which is bearish, but the new moon tomorrow which is bullish. Traders will also have the FOMC on Wednesday in their sights – Goldman Sachs reckon a 75% chance of QE – I don’t expect QE, but general market expectations into it could influence whether we rise into the announcement or fall. I will update my models tomorrow with the extended forecasts, but the current geomagnetic storm combined with the new moon makes for shallow upside from here into Wednesday before the model then falls away to the downside. I think that’s feasible – that the market holds fairly steady until the FOMC output. We’ll see how things develop today. Fed no longer has enough short-term paper to “Twist” out in duration, so that play is all used up. I have updated all the models. I have taken a couple more long profits, leaving the bulk in tact.